The first sports car was arguably a Vauxhall. In 1910 Vauxhall Motors built three versions of a car called the C-10 which was designed to run in the Prince Henry Speed Trials in Germany. In 1911 the car was launched to the public as the Vauxhall Prince Henry. It was 4 metres long, weighed 1250kg and produced 60hp. Later in 1911 a company called Austro Daimler released a replica of the Vaxhaull Prince Henry and called the it the Prinz Heinrich. The Austro Daimler version was subtly altered from the Vauxhall version by the company's chief designer Ferdinand Porsche. The Prince Henry was a convertible but sports cars can either be open tops or coupés. Incidentally the word coupé is the French word for cut. In the 19th century some horse drawn carriages had four seats. Those at the front faced backwards and those at the rear forwards. Carriages that had the rearwards facing seats removed and the body shortened were called coupés as the body itself had been cut to make the carriage smaller, lighter and faster. A coupé which had no roof was known as a coupé de-ville. Ever since then sports cars have come along in leaps and bounds and today Porsche is perhaps the name most synonymous with sports cars. Most car manufacturers produce at least one sports car and some produce nothing but sports cars. Sports cars have always been popular but unfortunately few people actually buy one so they have are also something of a niche product. By their very design sports cars are considered impractical by many drivers. The rear seats are either non-existent or tiny, the engines are usually built for speed and some people don't like to sit so low to the ground. Defining what a sports car is can be difficult. It's almost easier to say what isn't a sports car. A diesel is not a sports car. A front wheel drive car is not a sports cars. Just because it has coupe in the name does not necessarily a sports car. Not all convertibles are sports cars. By those definitions an Audi TT is a sports car but a TT TDI is not because it has a diesel engine. It is merely a diesel coupé (or convertible). Same goes for a front wheel drive TT. Mercedes' SLK is a definitive sports car, but not with a diesel engine. Similarly a BMW X4 or X6 may be called a coupé by the manufacturer by they are most definately not sports cars. A Golf convertible is not a sports car as it is front wheel drive. In 1981 the Toyota Celica went from being a four door saloon to a rear wheel drive coupe and it turned into a sports car. In 1985 a new Celica was launched. It looked more sporty than the old model but was front wheel drive. It then ceased to be a sports car and was merely a coupé. But being a rear wheel drive coupe or convertible is not enough. The rather rakish Rolls Royce Wraith is a rear wheel drive coupe and the Bentley Continental is a four wheel drive convertible and coupe. Both are laudable cars but neither is a sports car. They are too big and heavy. They are grand tourers, as is the Maserati GranTurismo. A sports car is low, a sports car is rear (or possibly four) wheel drive, a sports car is light, a sports car is impractical, a sports car handles better than a saloon, a sports car looks good and makes the driver feel good, a sports car attracts the stares of passers by and a sports car is desired by the man or woman in his or her company eco-box saloon. Many sports cars are powerful and ultra-fast. Some, such as a Porsche 911, are designed to go round a circuit quickly and others, such as the Jaguar F-Type are designed as much for the sense of joie de vivre they engender on the occupants as the speed they are capable of. Some sports cars don't have much power yet hold just as much credence in the sports car genre as their more powerful brethren. A 63bhp Suzuki Cappuccino is every inch a sports car as is the 130bhp Mazda MX5 and the 200bhp Subaru BRZ. 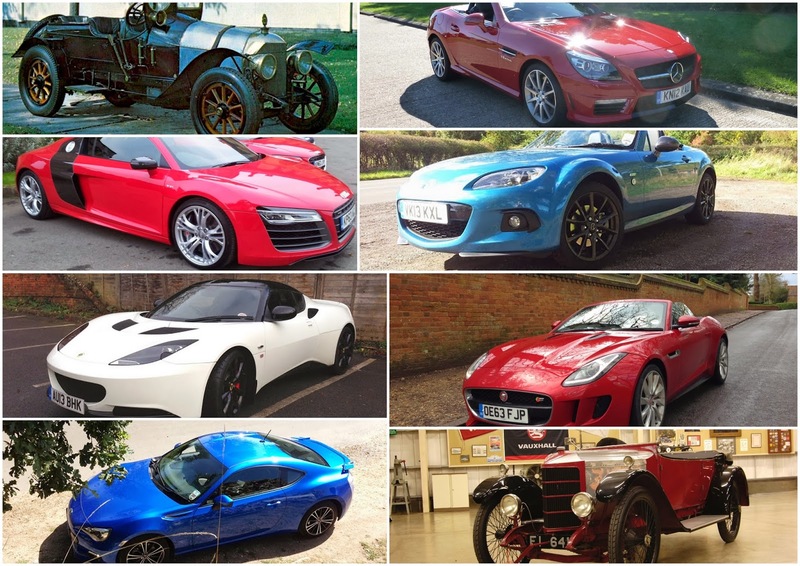 People buy a non-sports car for various reasons. Some like SUVs because of the high riding position but I find being low down gives more enjoyment and is more empowering on the road than sitting up high with all the other clones. Some buy a car for its space, but if you don't actually use those rear seats or boot that much then why lug around all that extra weight with it's impact on efficiency, handling and economy? Some buy a car for it's low tax and economy. Sports cars can be economical if you look around. A BMW Z4 sDrive18i might not be the most dynamic but it is a sports car yet it returns 41mpg and produces 159 g/km of CO2. And it does 0-60 in 7.9 seconds. Lotus make some of the best sports cars on the planet. The £29k Lotus Elise does 0-60 in 6 seconds, returns 45mpg and produces 149 g/km of CO2. That's more efficient than even the most economical SUVs, and it'll put a big smile on your face every time you get in it. Sports cars are brilliant. They bring enjoyment, they look great and they give one a sense of inner peace. I urge you to ditch that econobox and buy a sports cars. There's one to suit every budget. I've driven lots of sports cars. You can find all the reviews here. My favourites are the Lotus Evora, Jaguar F-Type V8 S, Subaru BRZ, Porsche 911 and my own Porsche 924S.